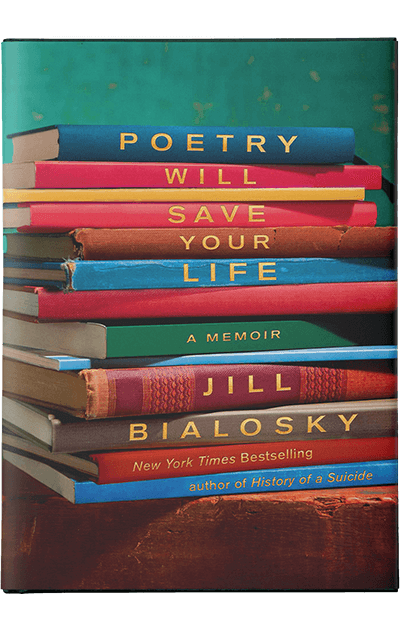 In Poetry Will Save Your Life, poet, novelist, and New York Times bestselling author Jill Bialosky takes a wholly original approach to memoir, refracting her life through the prism of poems that have shaped, inspired, and helped her make sense of the world around her. At once highly personal and marked by keenly observed universal themes, Bialosky’s probing exploration touches on both familiar poetic classics and lesser-known gems that have had special significance. Bialosky’s lifelong immersion in poetry began in the fourth grade with the discovery of Robert Frost’s “The Road Not Taken.” An awkward child whose father died before she was old enough to remember him, Bialosky finds that the poem speaks to her of an alternative life where her father had lived and her mother was happy and offered her a way to think about her own path she might forge. As her life progresses from girlhood to adolescence to adulthood and motherhood, poems bear witness to her experiences, large and small, to the ways in which we live in the world and to our shared humanity. Emily Dickinson provides insight into questions of faith, Sylvia Plath illuminates the mysterious pull of depression, Louise Gluck on envy, James Wright and Keats on first love. Poems offer signposts for the significant moments in a life—sexual awakening, leaving home, the loss of a parent and the deaths of a child, the joys of motherhood, a sister’s suicide, a mother’s aging, the day in New York City when the Twin Towers fell. Bialosky frames each poem with its Life and Afterlife—chronicling how the poem spoke to her at a formative time and also how its meanings and implications have deepened for her over time. As an acclaimed poet and editor herself, Bialosky moves beyond the personal to investigate the essence of what makes these poems more widely significant, explicating the art of poetry for readers who will surely find their own connections to these poems—and to others and in doing so demystifies poetry and makes a compelling argument for its necessity in our lives. With equal parts candor, empathy, and passion, Jill Bialosky shows how intricately tied poetry is to our own experiences and, at the same time, offers a celebration of the power of an enduring art form. Poetry Will Save Your Life is a singularly moving and illuminating work from “a fearless and clear-eyed and compassionate writer” (George Howe Colt, author of November of the Soul). How poetry offers a new way of seeing.